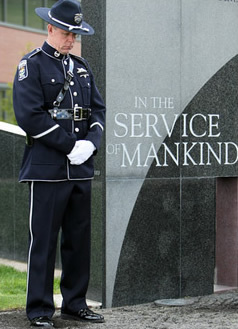 Hosted by the Oregon Department of Public Safety Standards & Training, the 2019 Oregon Law Enforcement Memorial Ceremony will take place on Tuesday, May 7, 2018 at 1:00 PM. The ceremony will consist of honors conducted by honor guard units from across the state and will feature several prominent speakers. It is free, open to the public, and is held at the Oregon Department of Public Safety Standards & Training at 4190 Aumsville Hwy SE in Salem.